Greetings! On behalf of the National Collegiate Table Tennis Association, I would like to take a moment to introduce you to the exciting sport of college table tennis. The National Collegiate Table Tennis Association (NCTTA) is a government-recognized 501©(3) non-profit organization dedicated to promoting competitive college table tennis in the US and Canada. NCTTA works with USA Table Tennis, the sport's national governing body, to further progress the purpose and development of table tennis in America. Check out this highlight reel from our 2018 iSET Collegiate Championships this past April! We have 150+ institutions of higher education competing in college table tennis. Our participation of women's teams has increased to 50+ schools, reflecting a steady increase in interest among female athletes. 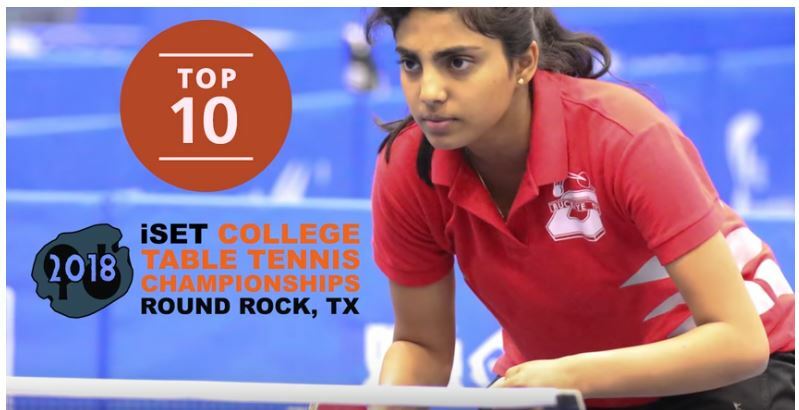 NCTTA continues to be the center point for Collegiate Table Tennis in the USA and Canada and will host regional events for qualifiers of division meets, as well as administering its own singles and doubles events. Every organization requires financial stability to meet its goals, both long and short term. Each year our board of directors is challenged to find new and creative ways to meet these goals. All of our directors are volunteers and participate because of our love for the sports - we can really use all the financial help we get! Not only will you help strengthen a developing sport, your donation is tax-deductible as well. We sincerely thank you in advance for all your support. Donate directly from your paycheck from work, check here to see if your company will match your donation! Please email treasurer@nctta.org if you wish to donate a different amount!